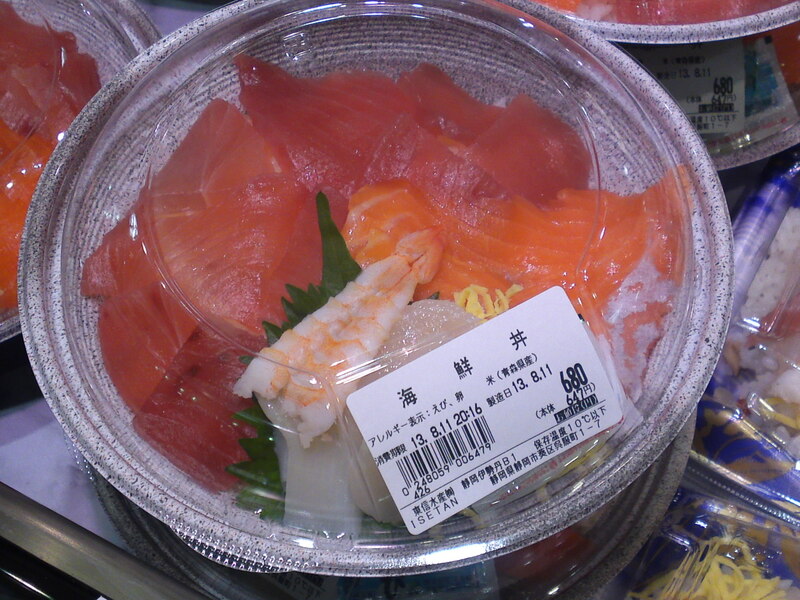 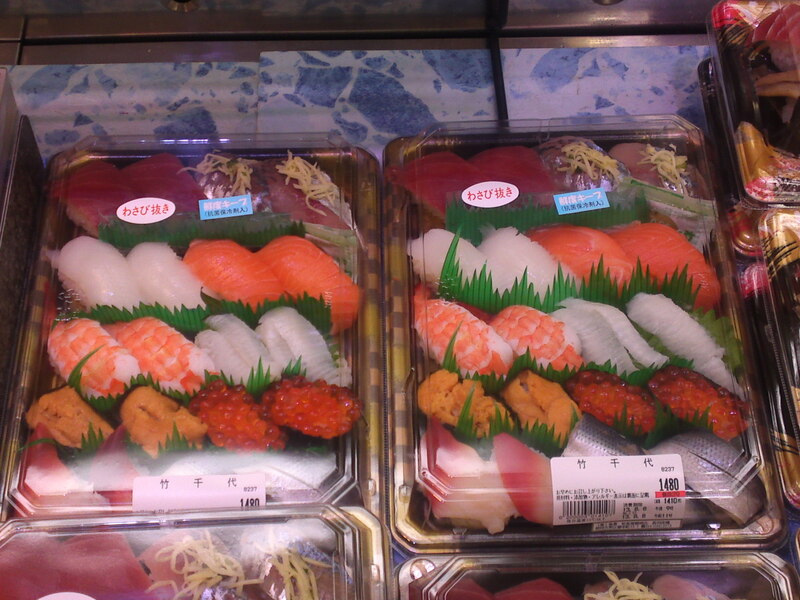 Do not ignore the great sashimi sets either at Cenova Department Store! 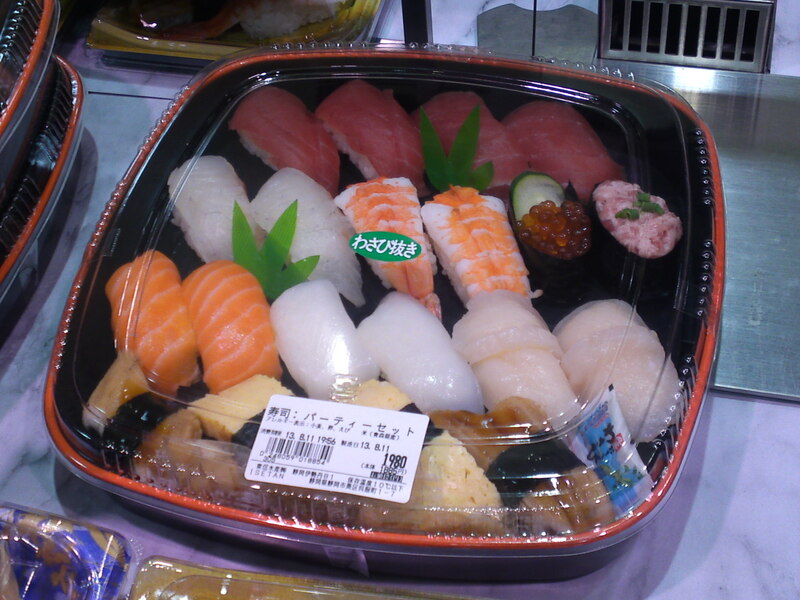 Let’ visit the first one which is affiliated to the supermarket at Shizuoka JR Station Parche Department Store! 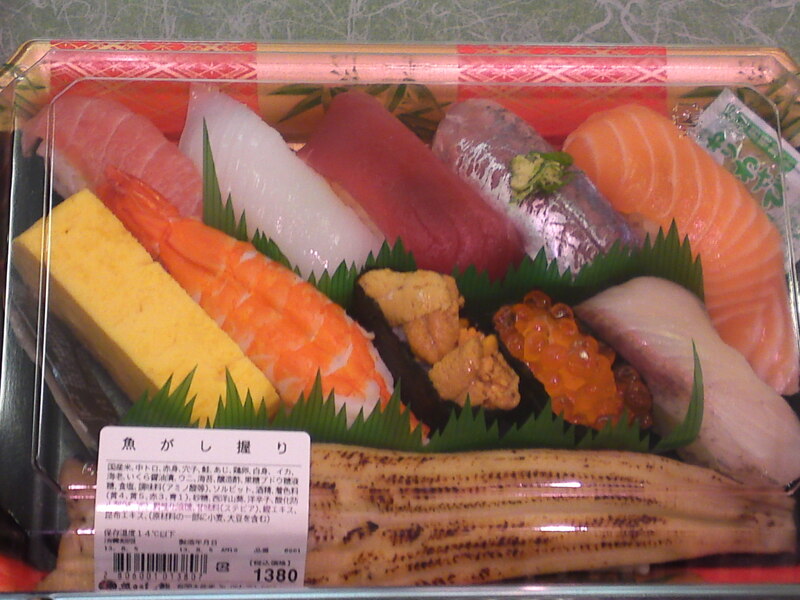 A classic set with no less than 11 varieties of sushi nigiri including the Shizuoka specialty, a big conger eel! 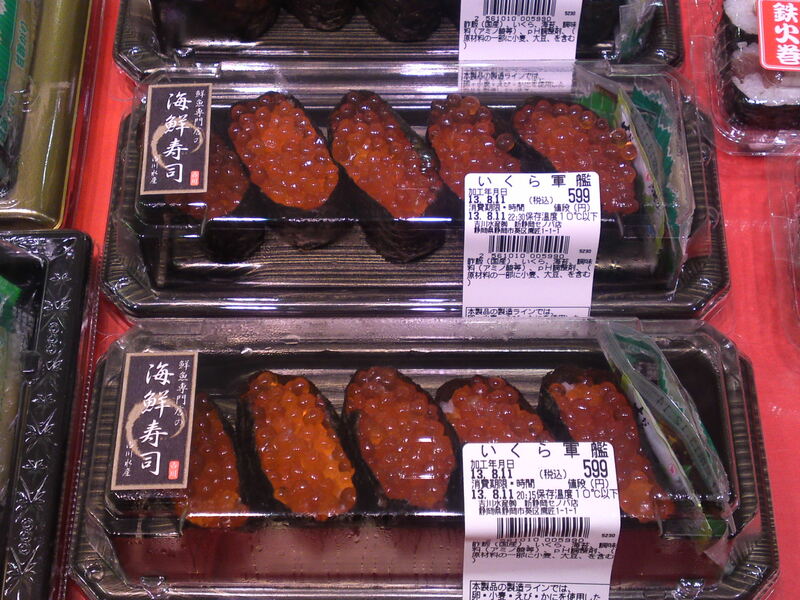 At 1,380 yen a bargain considering that ikura and sea urchin are also featured! 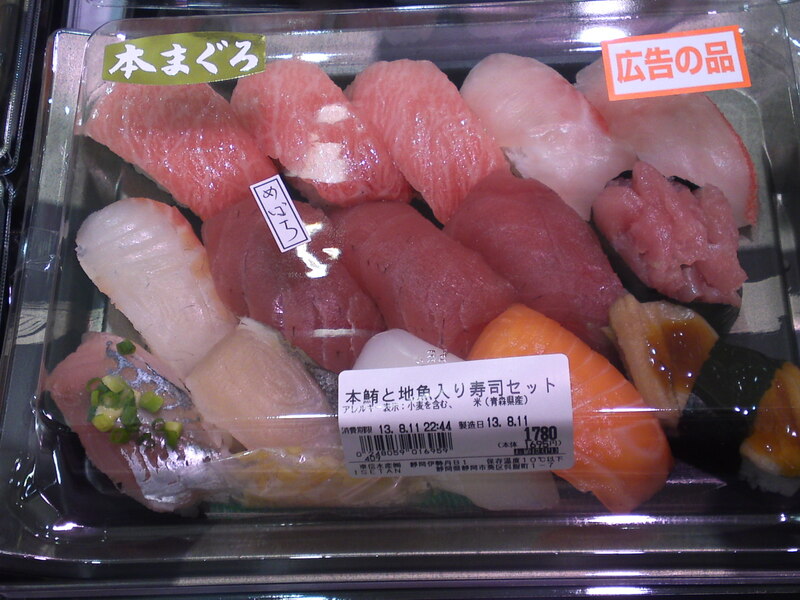 At 950 yen all seafood local coming from Numazu Harbor! 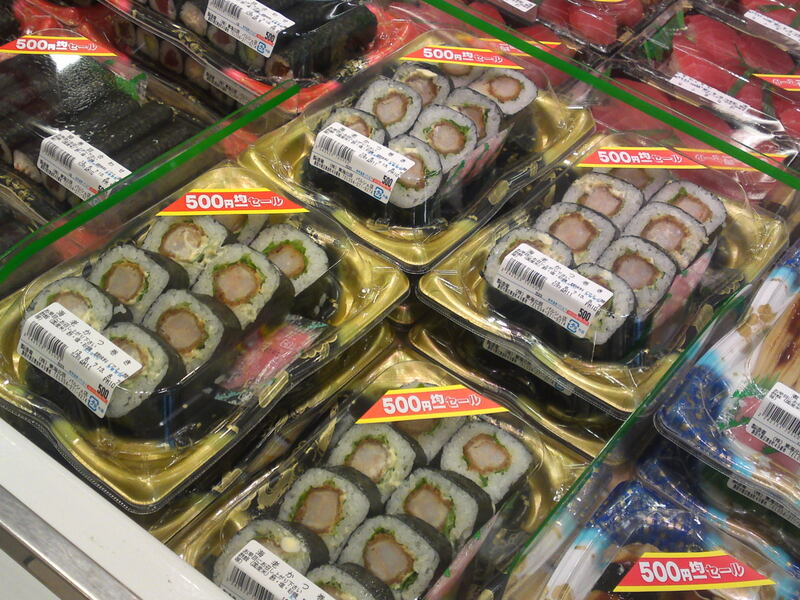 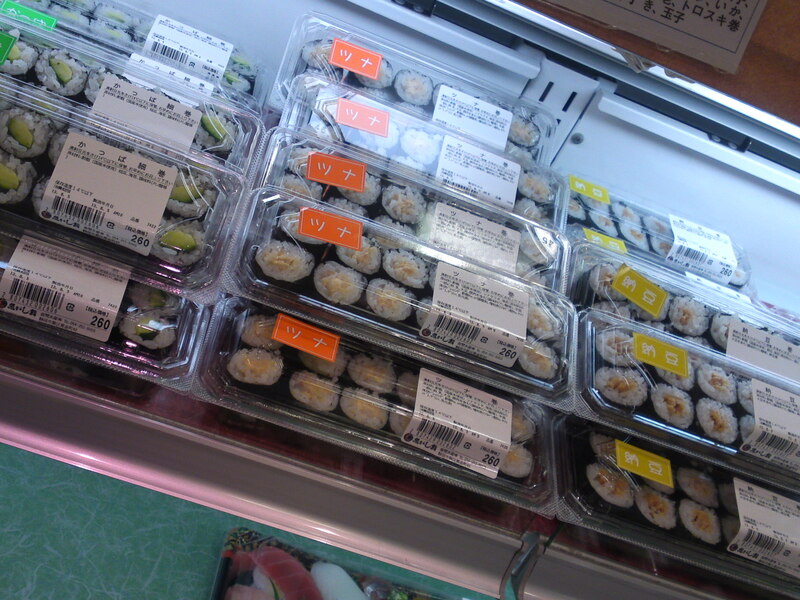 For the thin maki/rolls lovers at 260 yen a box! 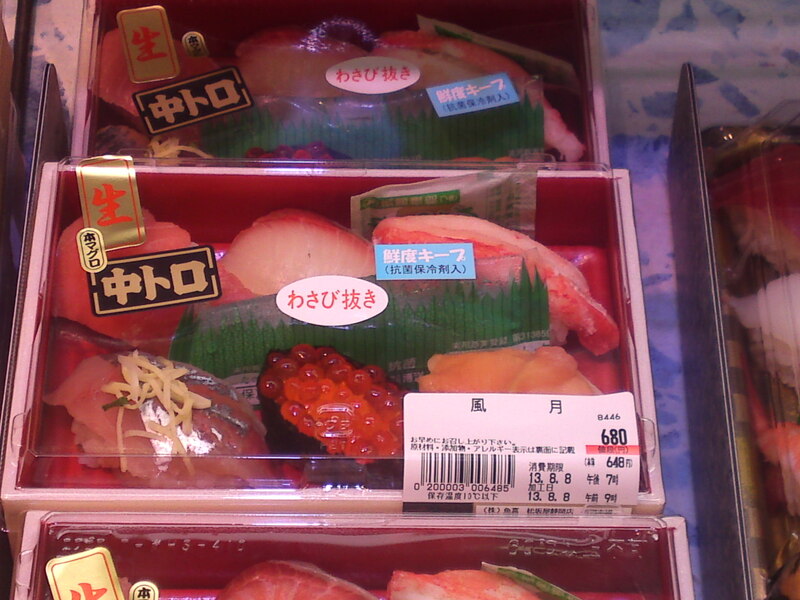 599 yen, another ridiculously low price for ikura! 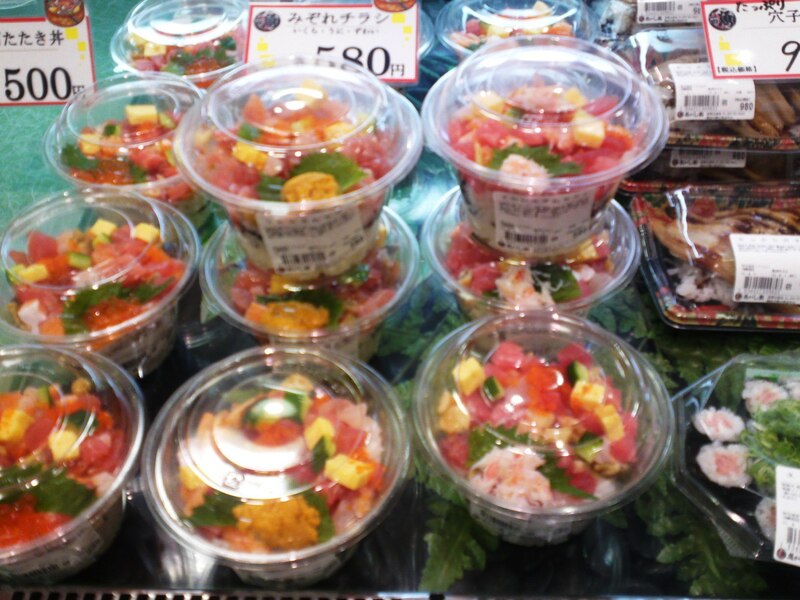 Maguro no Tsubu Don with pieces of tuna and sweet shrimps for 398 yen! 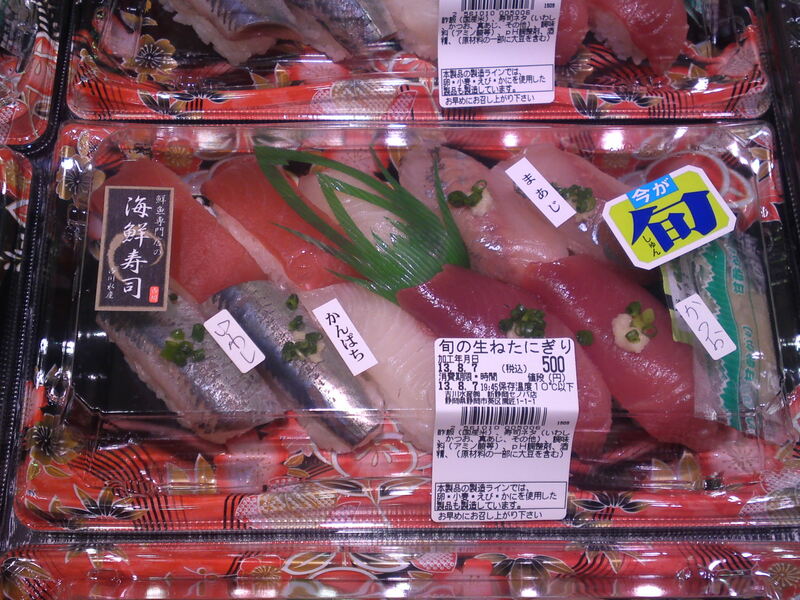 Seasonal fish only in sushi nigiri fwaturing sardine, tuna, pike mackerel, yellowtail, and bonito for 690 yen! 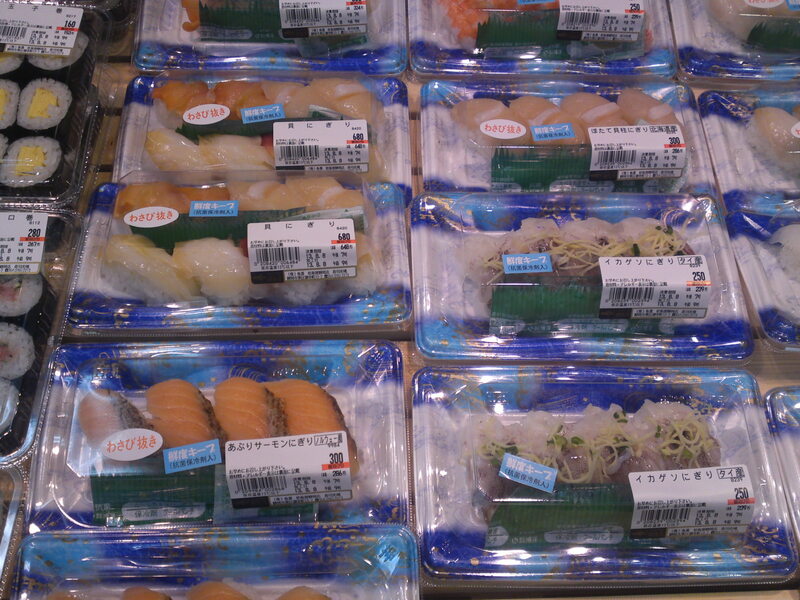 Another set at the same price but all sushi nigiri different including salmon, squid and scallops! 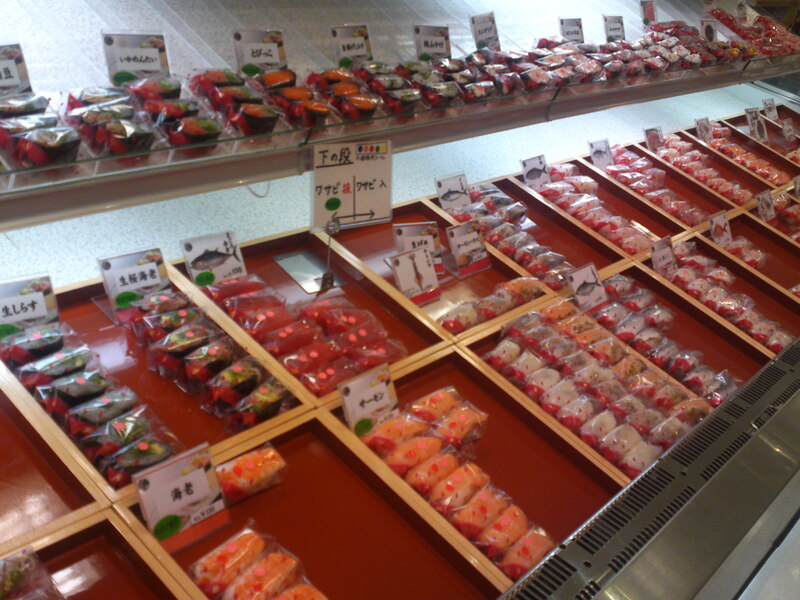 Almost the same for the same price but including negitoro/grated tuna and ikura! 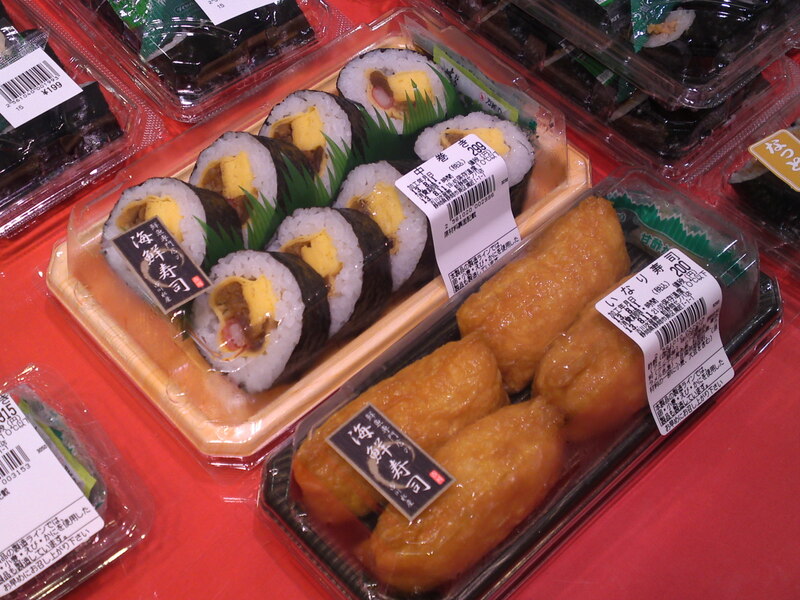 For the lovers of Large (actually medium here) Maki/Roll for 299 yen and inari sushi (sushi rice inside deep-fried sweet tofu pouches for 200 yen! 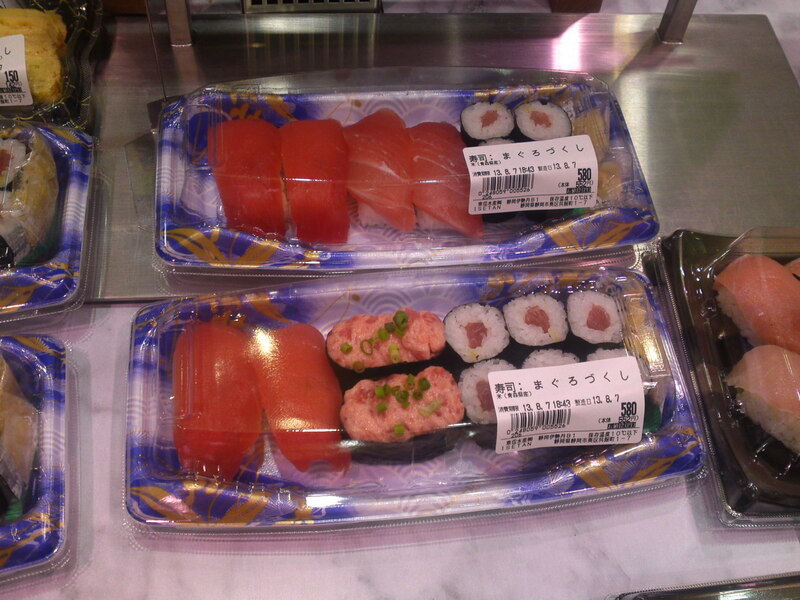 Next I will take you to the second supermarket owned by the Shizutetsu Stores Chain inside Cenova Department Store! 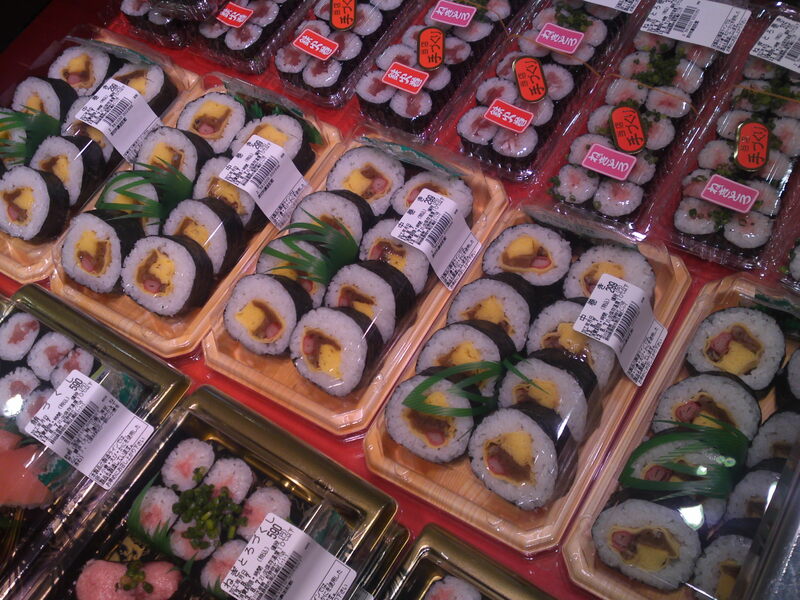 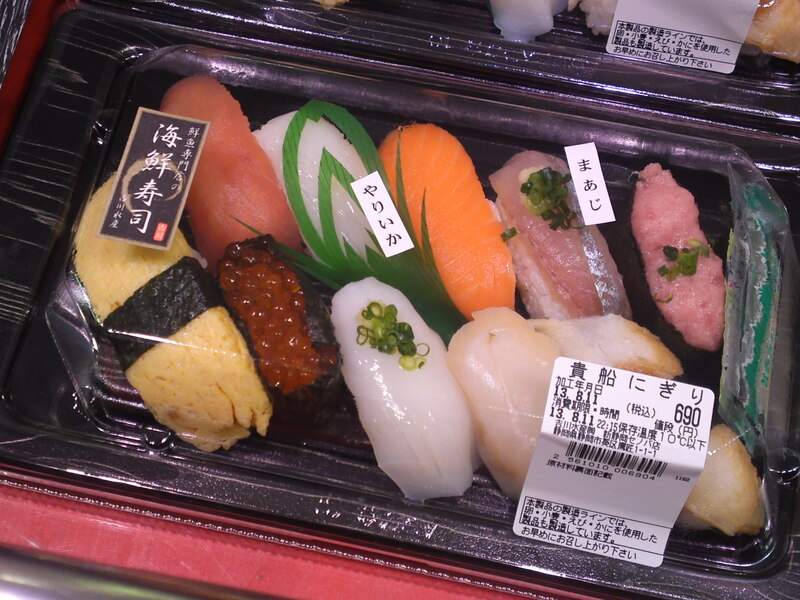 Devising your own sushi meal at Shizuoka JR Station Parche Department Store! 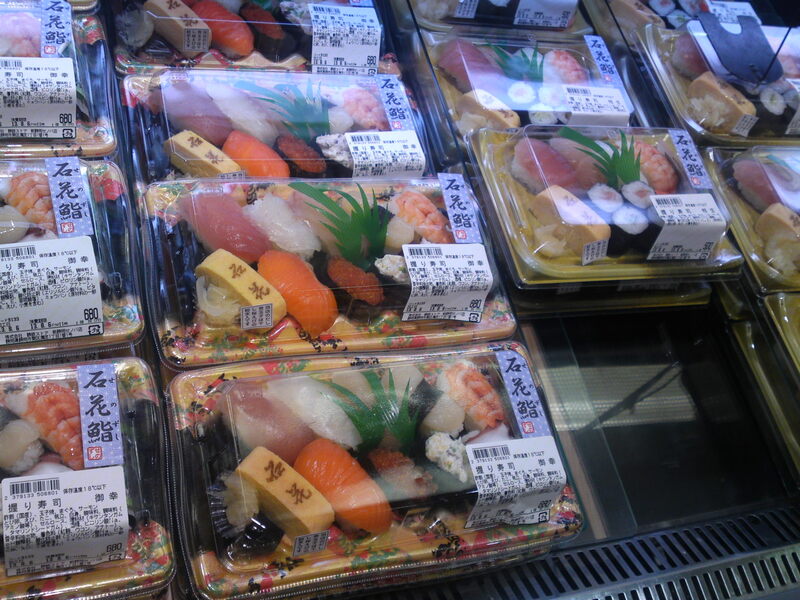 As promised in Part 1 I will take you next to another part of Shizuoka JR Station Parche Department Store. 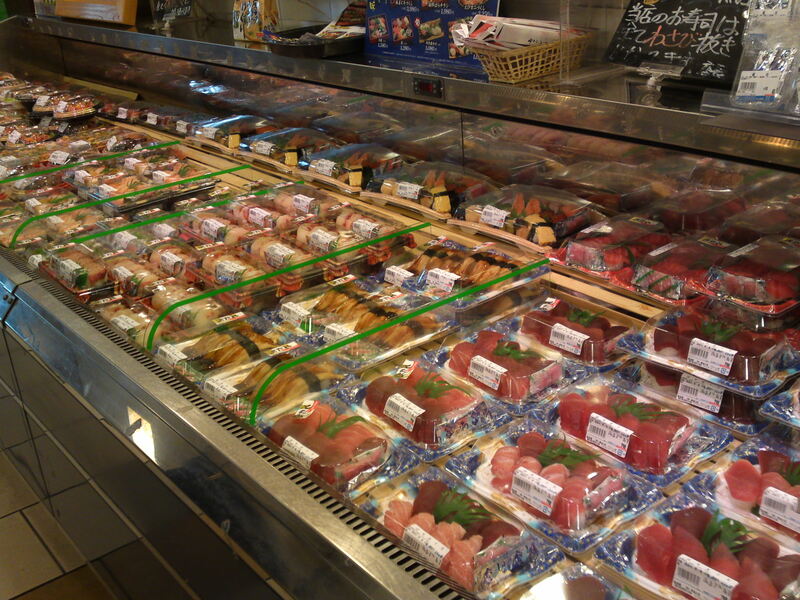 It is actually the first part of the market you can enter from inside the station. 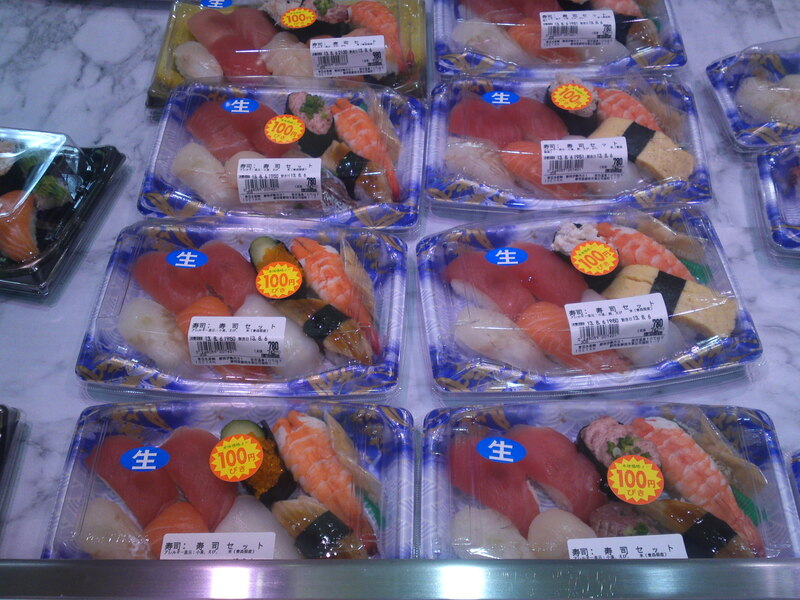 It is replete with all kinds of food to take out from Chinese to oden and of course sushi! 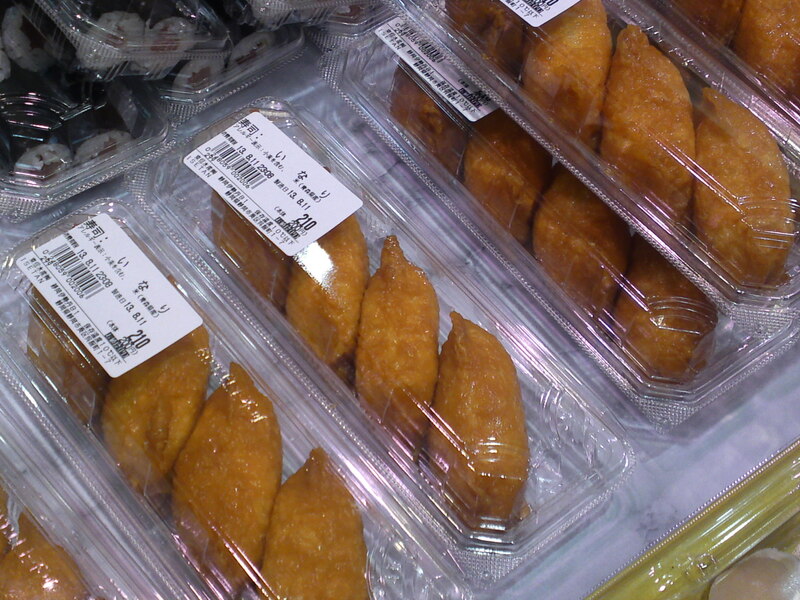 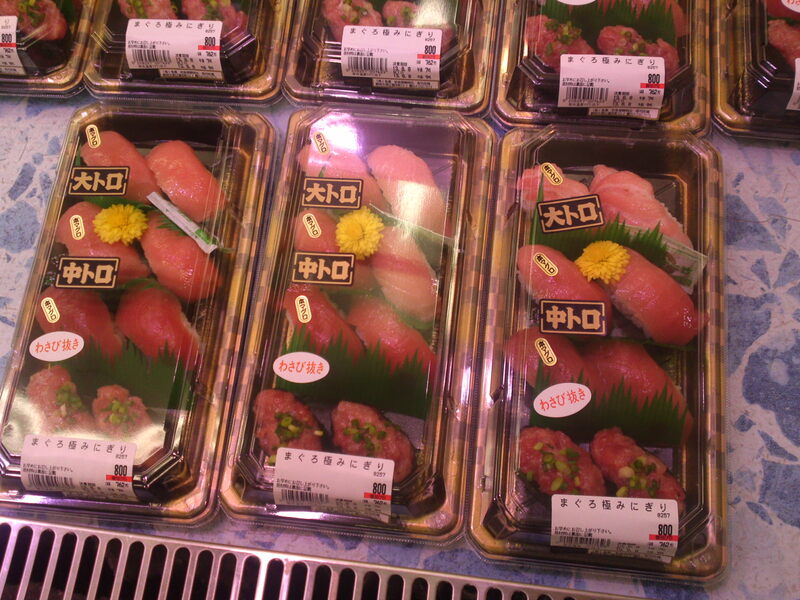 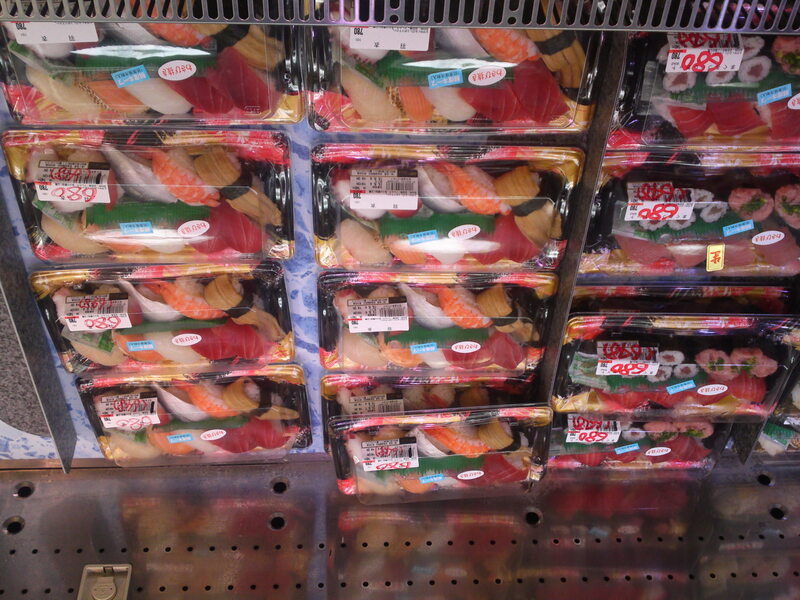 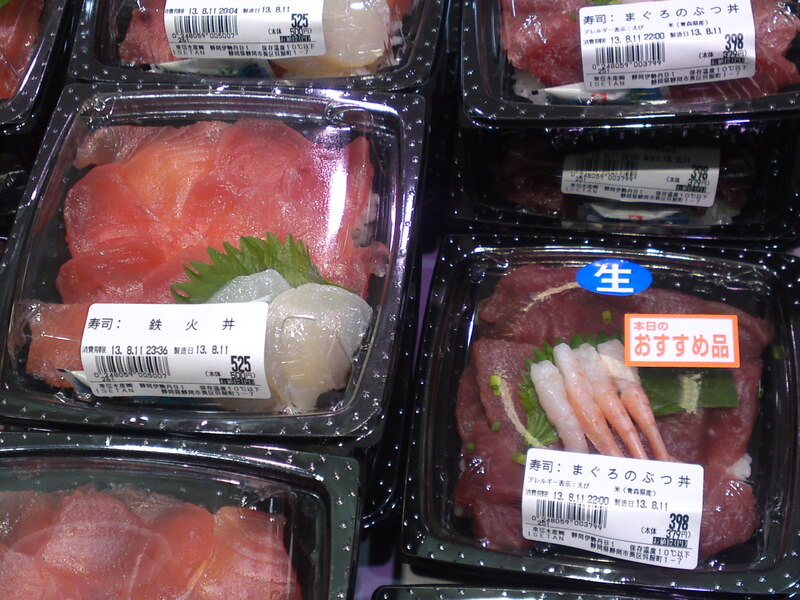 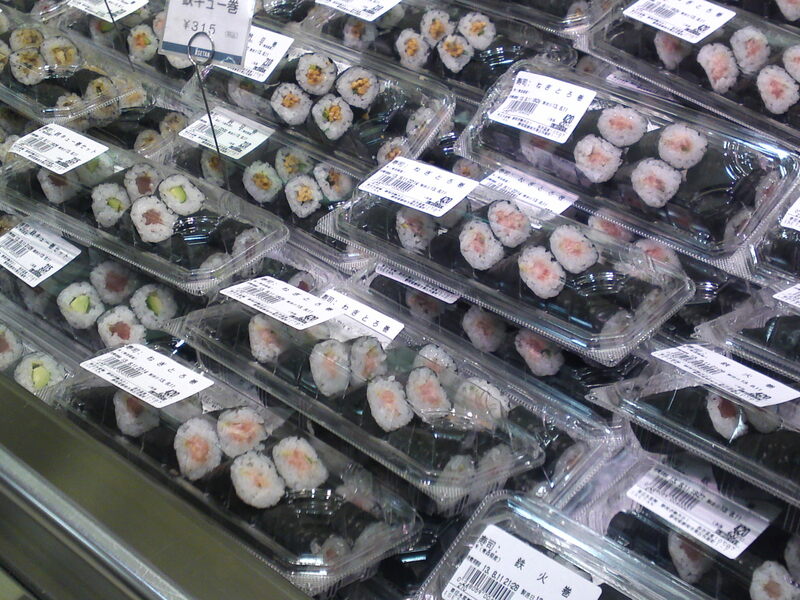 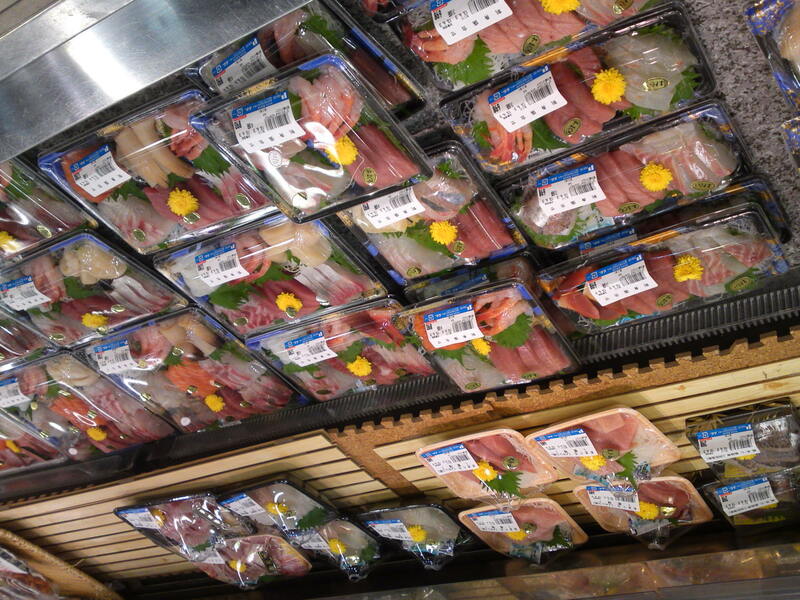 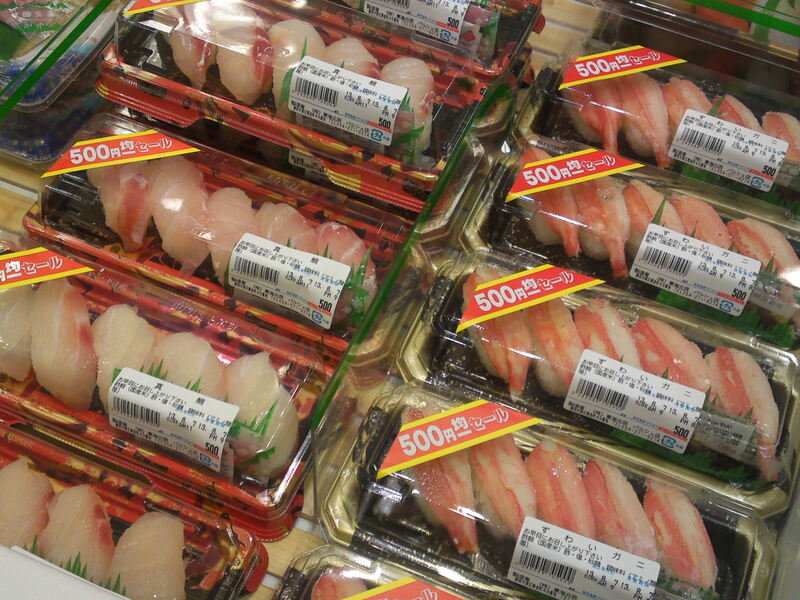 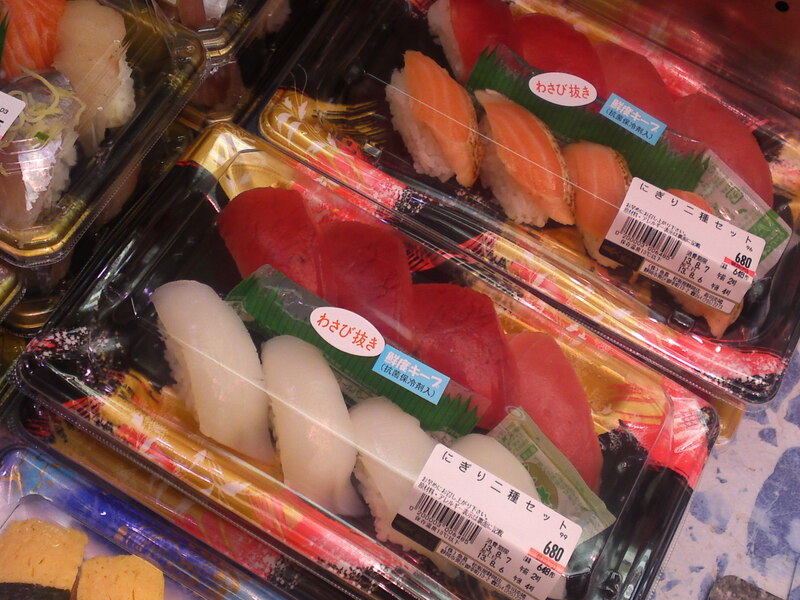 In that particular part of the supermarket sushi are sold by Uogashi Sushi Restaurants Chain Company which hails from Numazu City in the Eastern part of Shizuoka Prefecture. 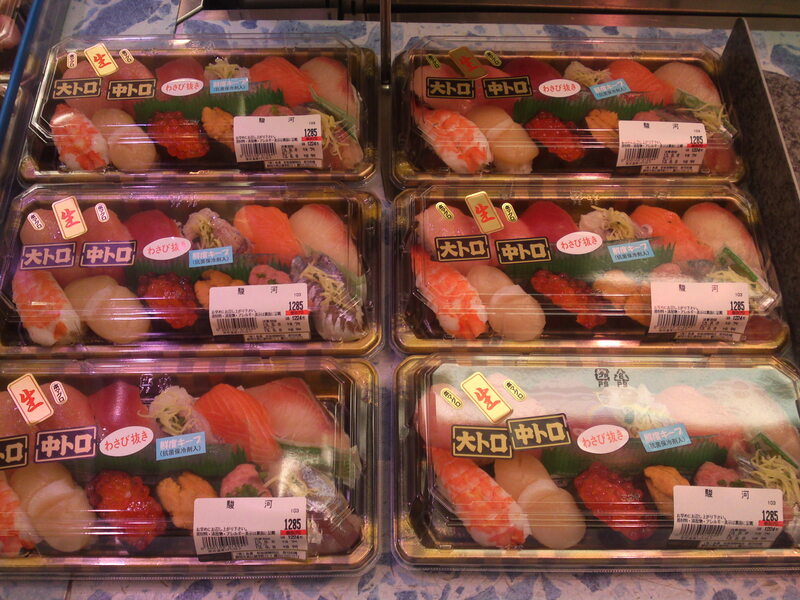 One of their attractions is that offer individual sushi nigiri all individually wrapped! 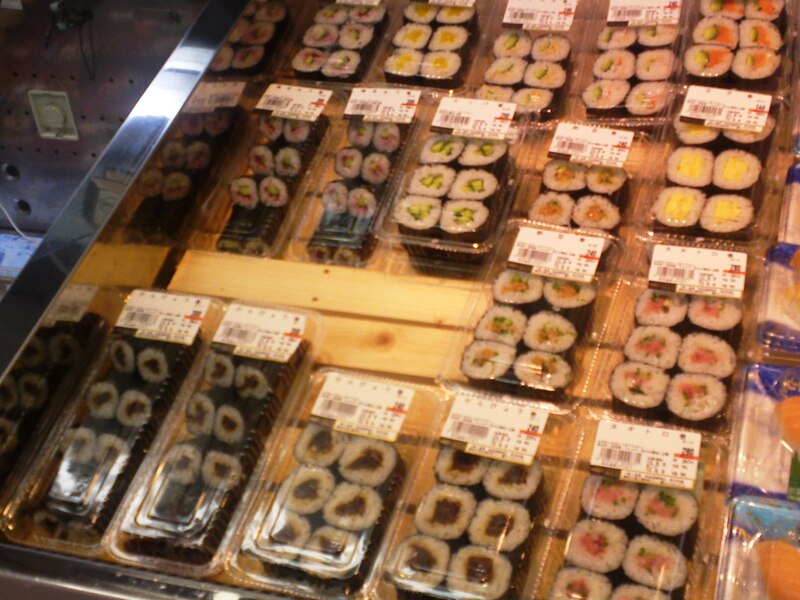 There are loads to choose from and I can tell you you will have a hard time choosing form them! 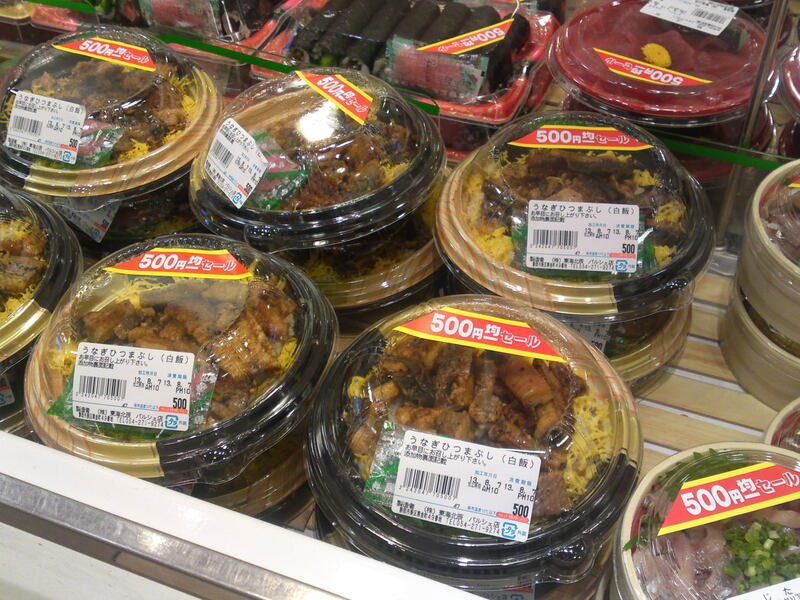 They also offer very reasonable (580 yen) shirashi donburi you can take home or to the office right away! 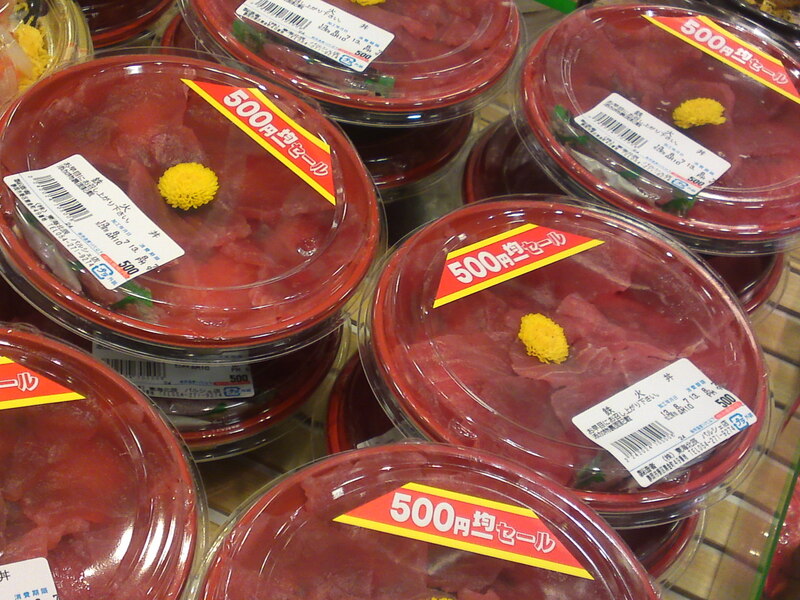 Kohaku Donburi/Red and White Donburi! 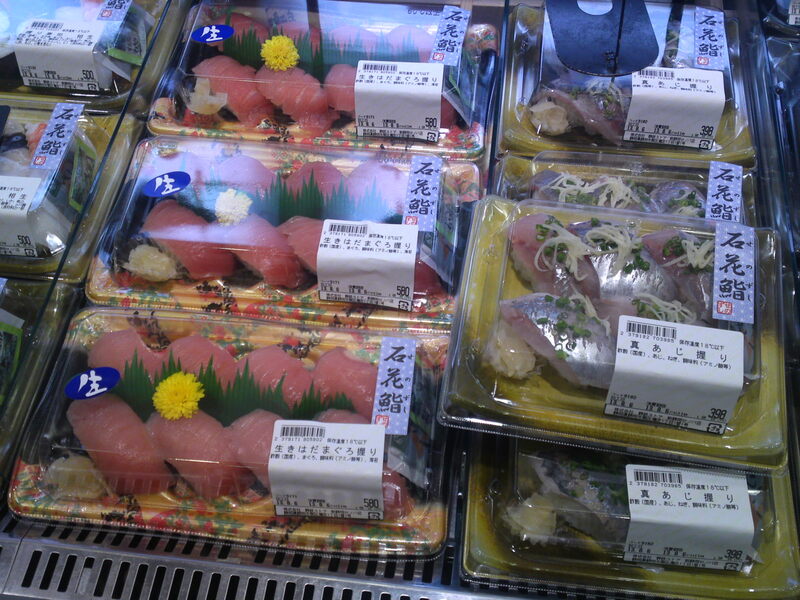 A combination you will probably never see away from japan: steamed shirasu/sardine whitebait and grated tuna (raw)! 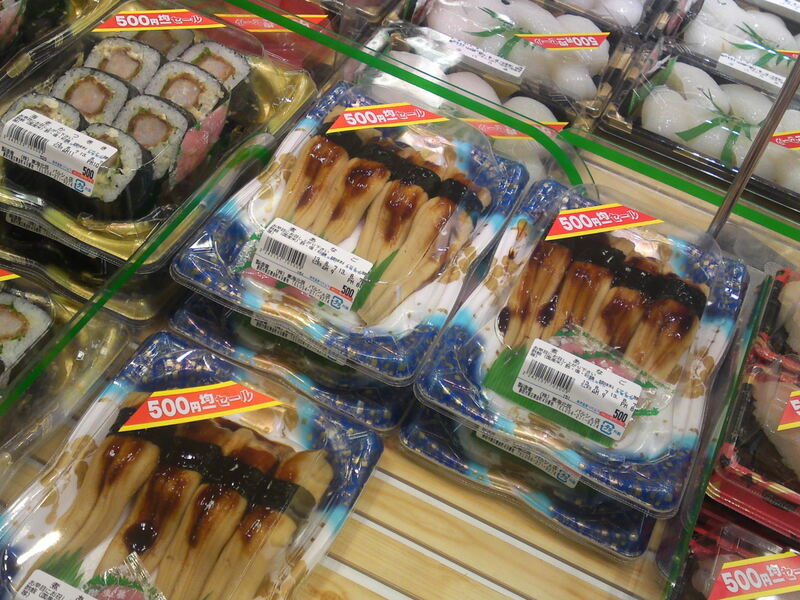 A delicacy! 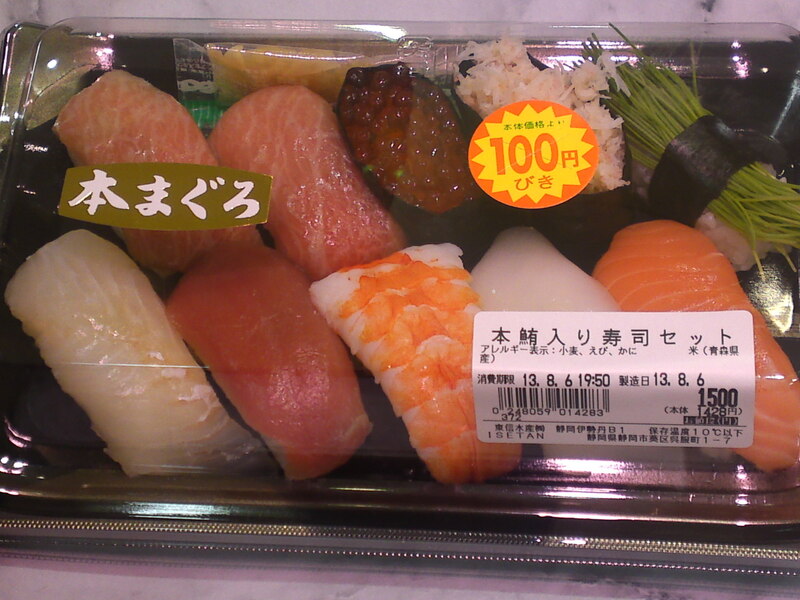 At 500 yen, a giveaway! 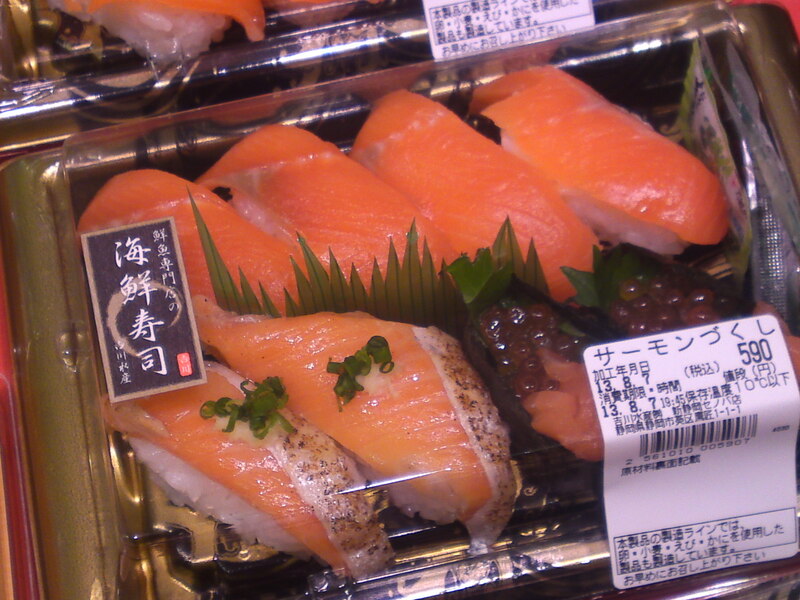 Mind you shirasu is a Shizuoka specialty! 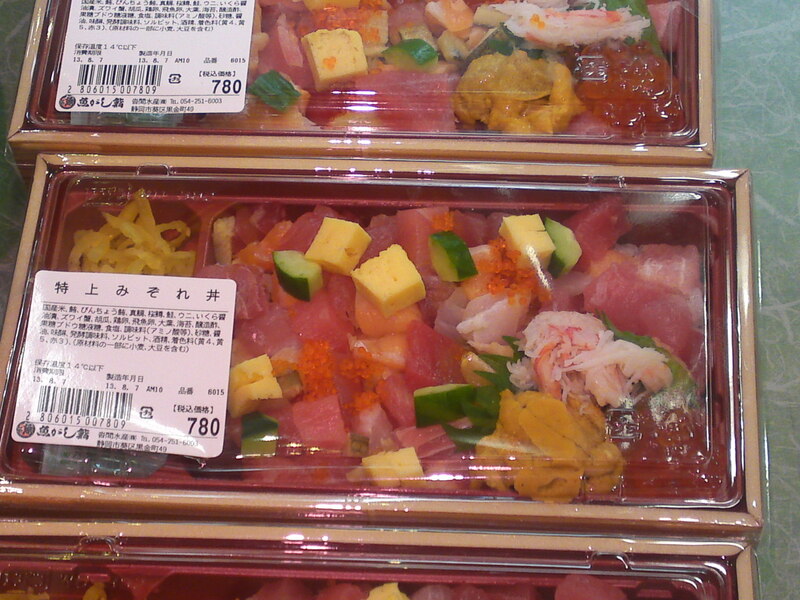 At only 780 yen, another giveaway including crab, sea urchin and raw tuna served as chirashi sushi! 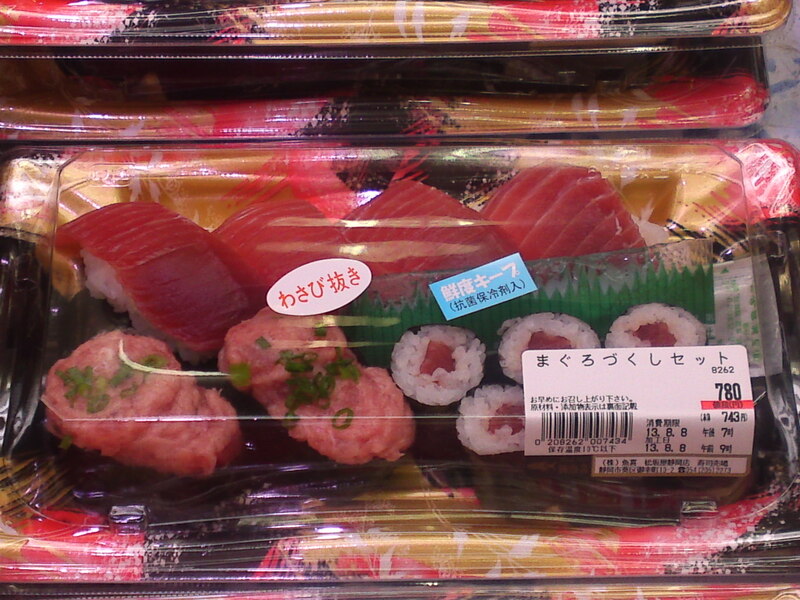 Temaki sushi! 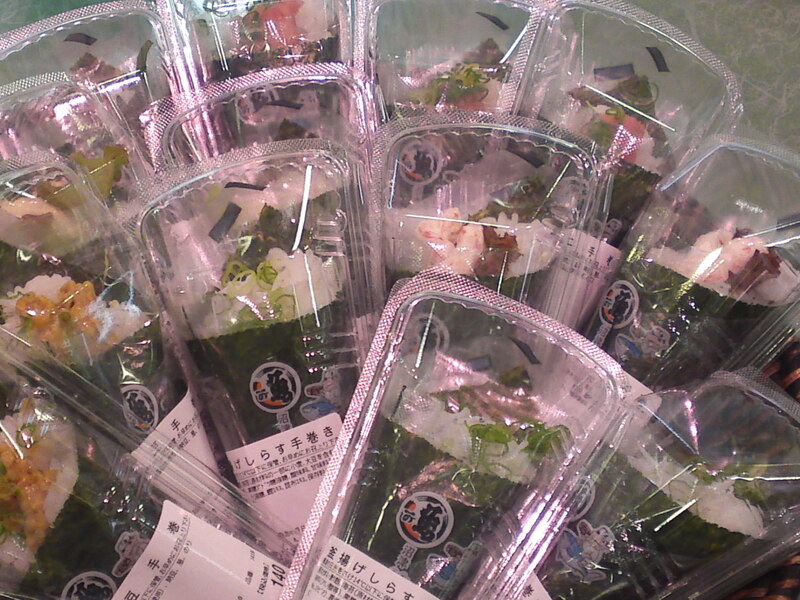 hand-made sushi “roll” conceived in a conical form easy to handle and eat! 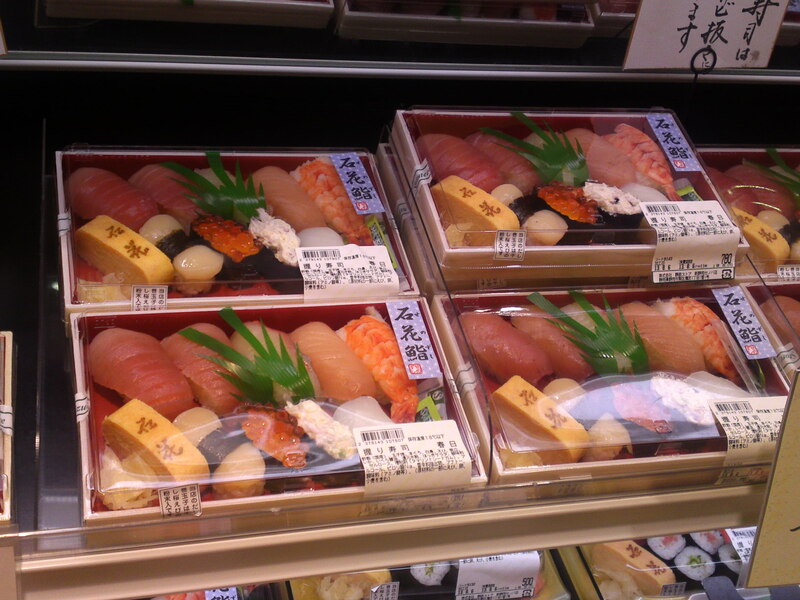 Priced between 140 and 220 yen. 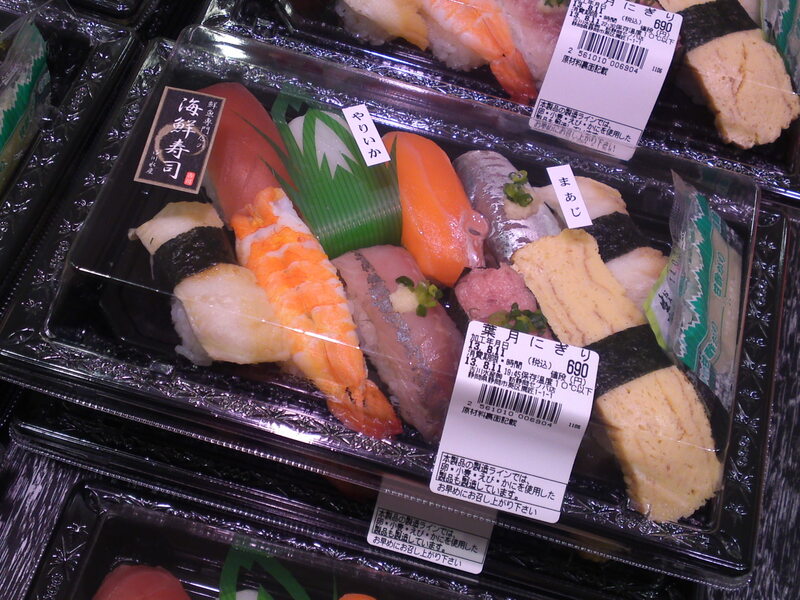 Note that the nori/dry seaweed is kept dry! 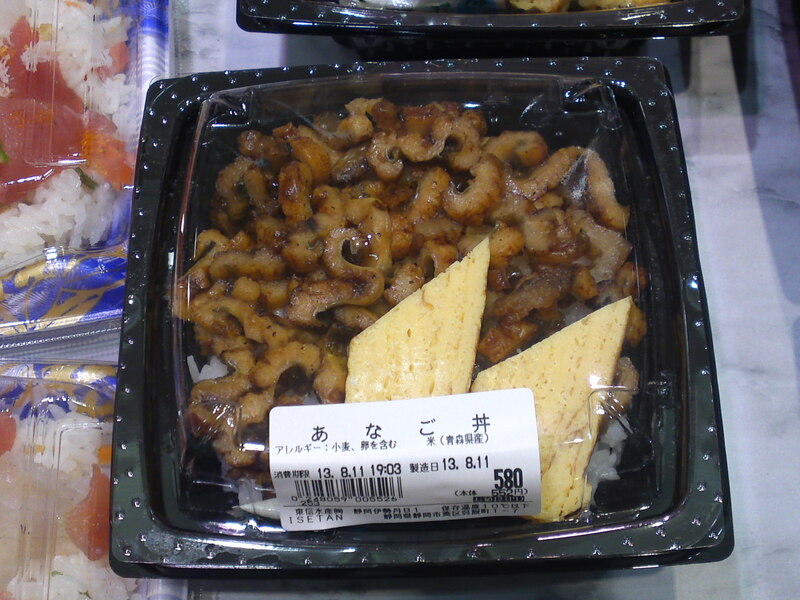 Tappuri (a lot) anago (conger eel) donburi! 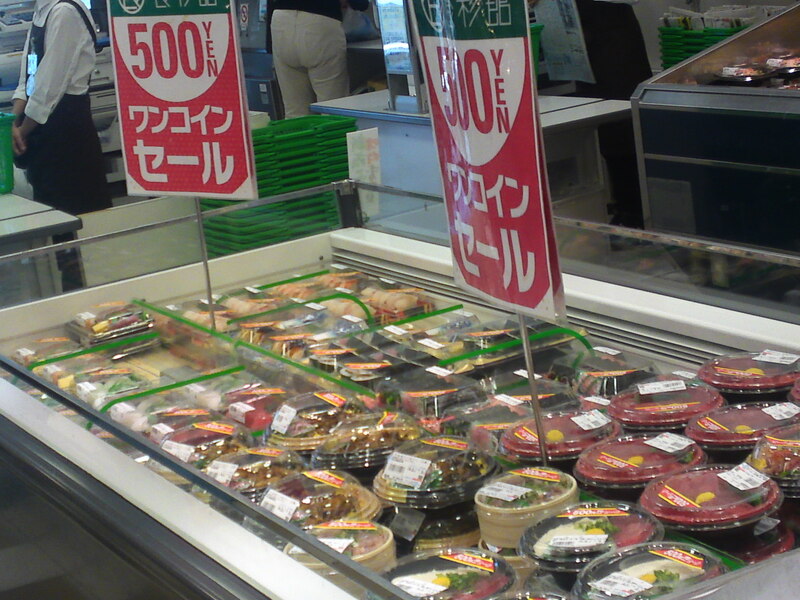 At 980 yen it is still a bargain considering the spiraling prices. 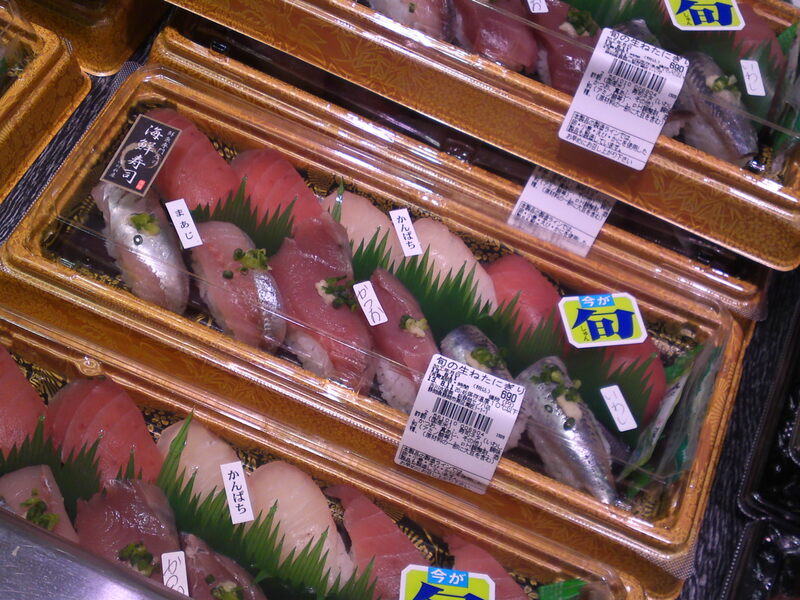 The fact that is a Shizuoka-bred fish does help! 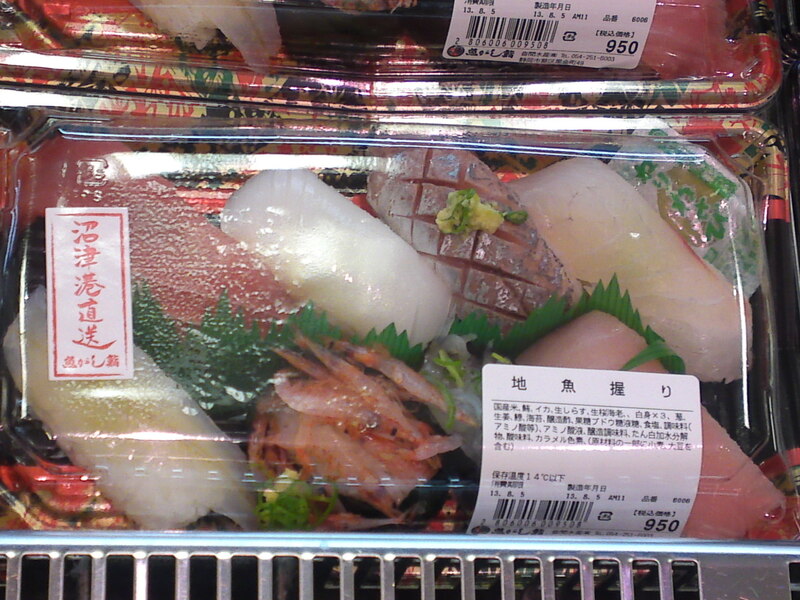 The broiled fish is very soft and a real delicacy! 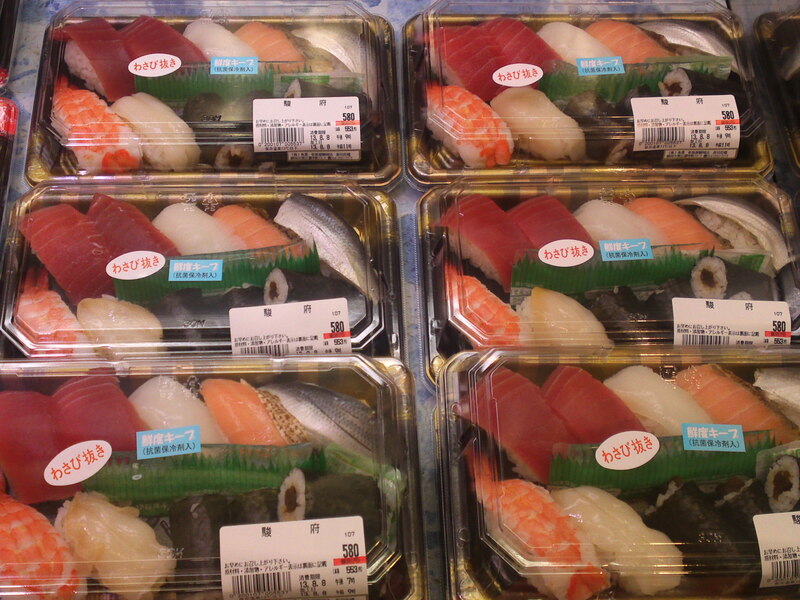 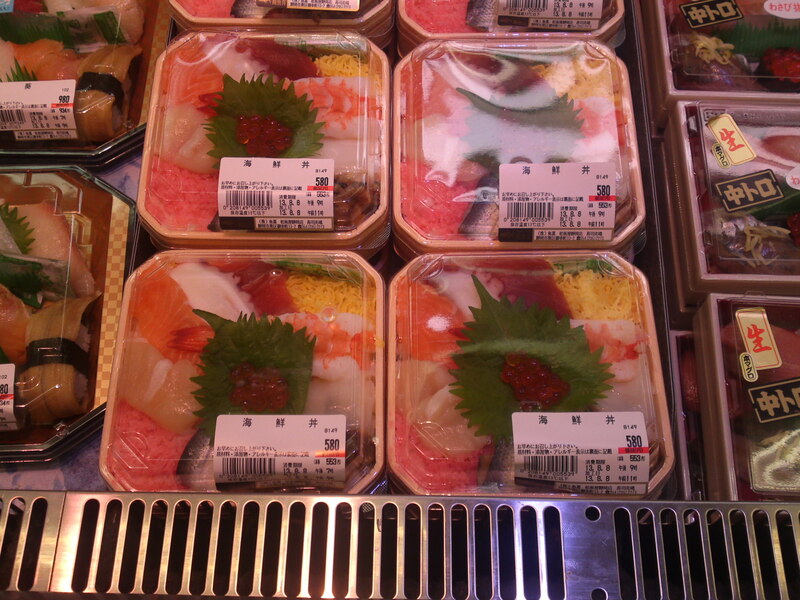 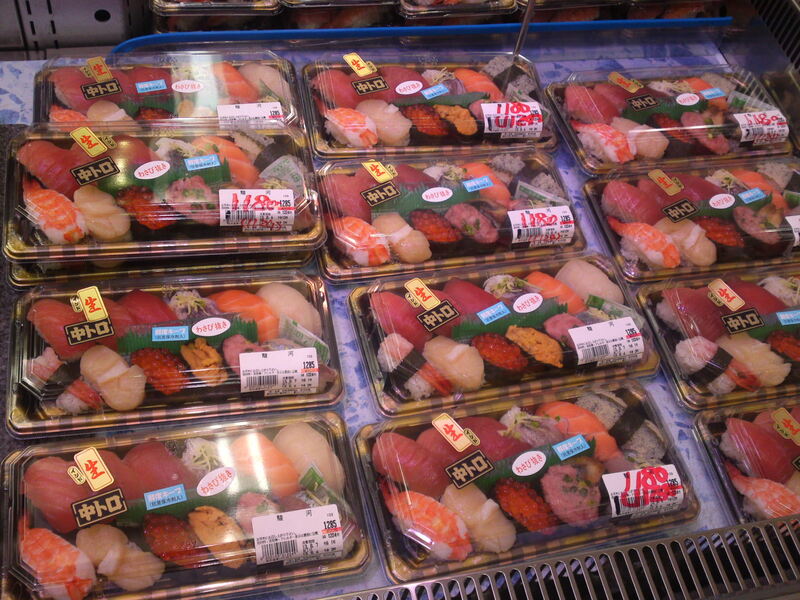 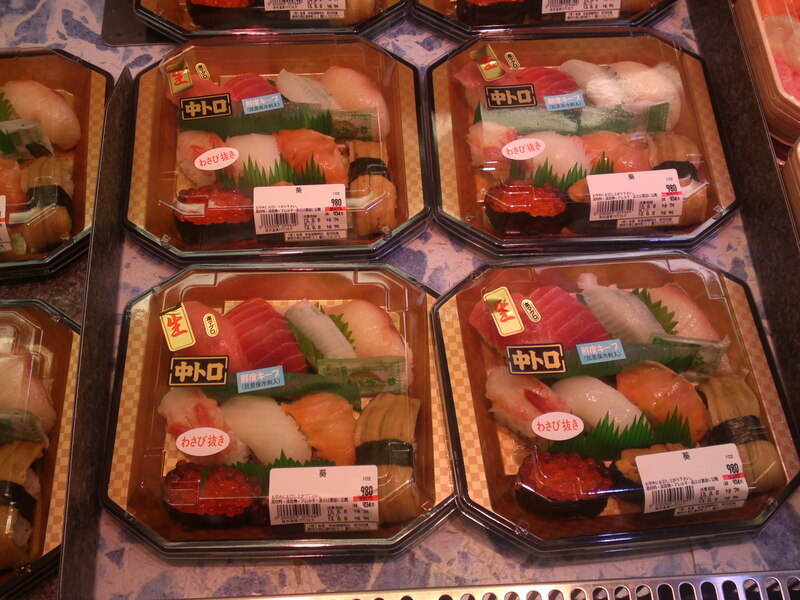 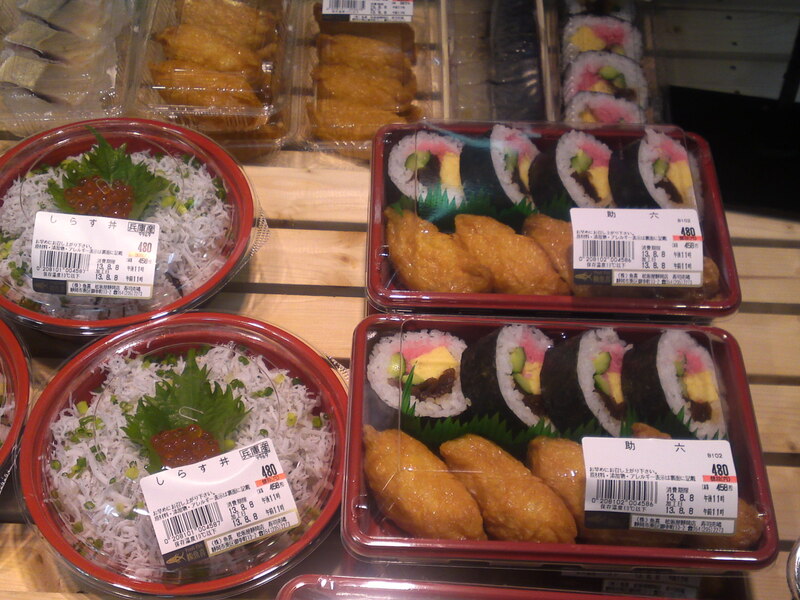 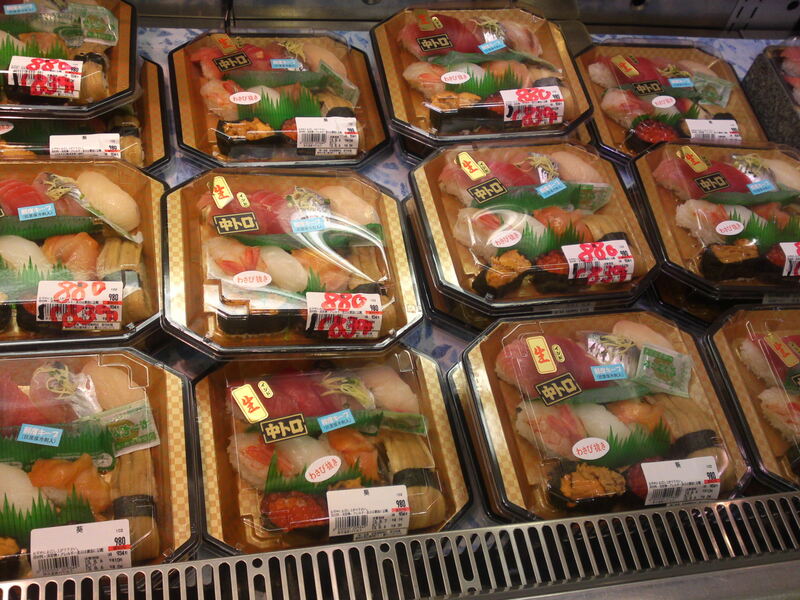 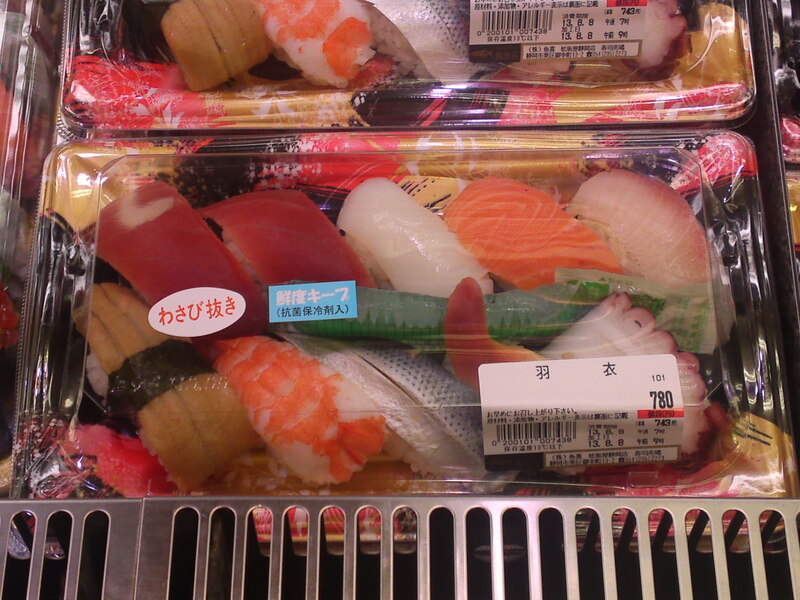 Sushi Lunch Bentos fro sale at 500 yen at Shizuoka JR Station Parche Supermarket! 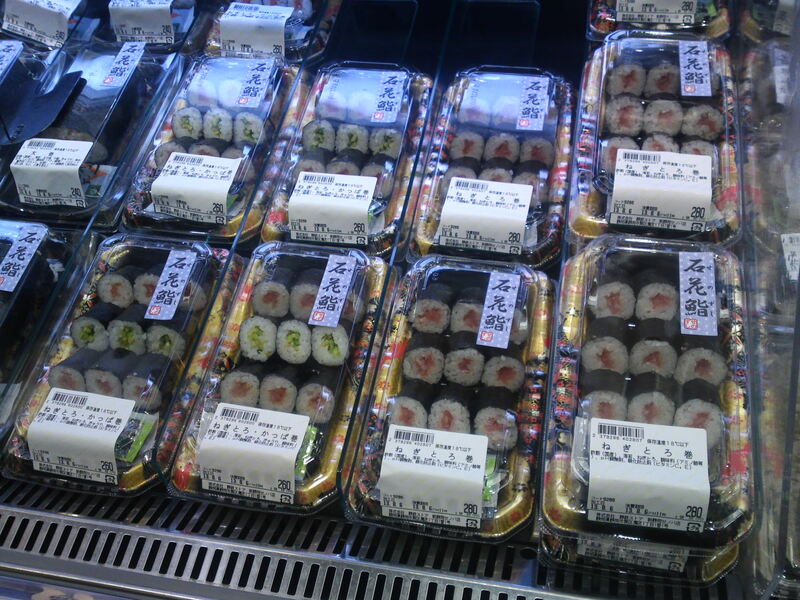 Let’s start with the big supermarket on the first (ground) floor Of Parche Department Store located above and around Shizuoka JR Station! 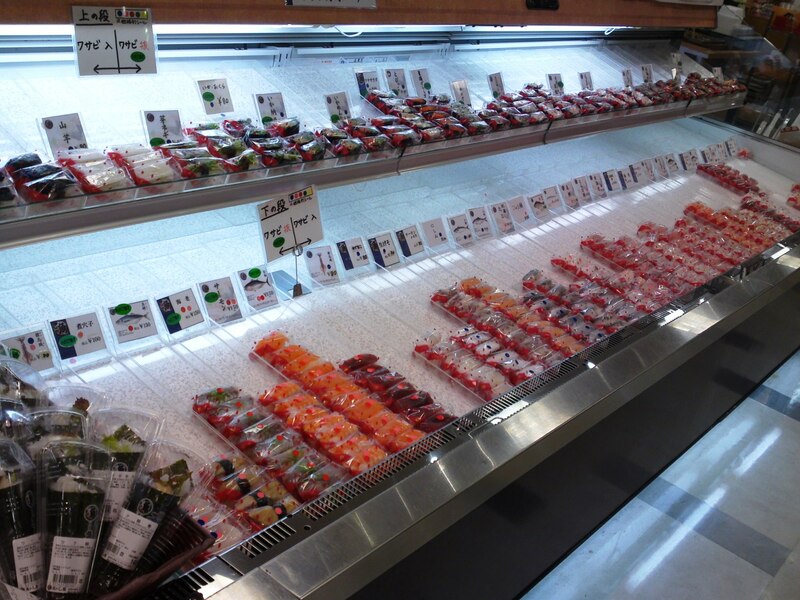 First go to the fish and seafood area at the very end of the supermarket near the fish stand where they conduct interesting sushi lunch set sales! 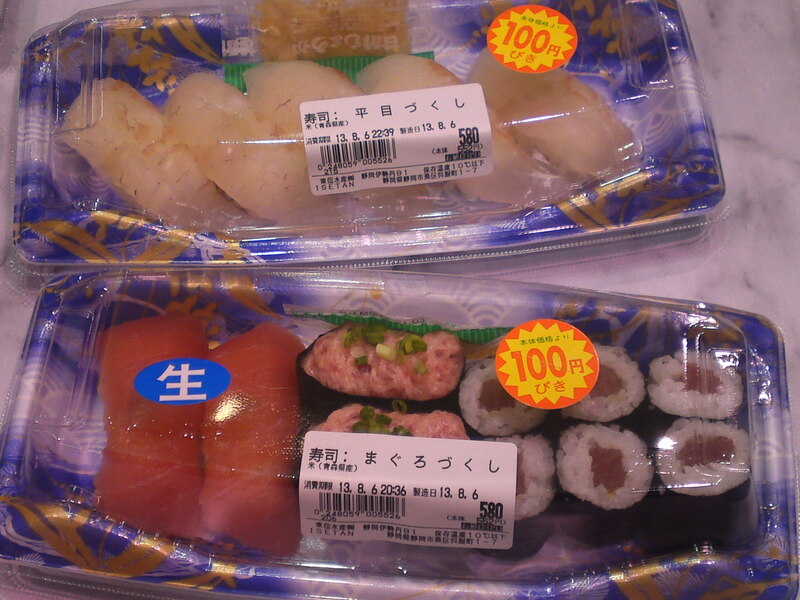 500 yen a box is cheap away from Japan! 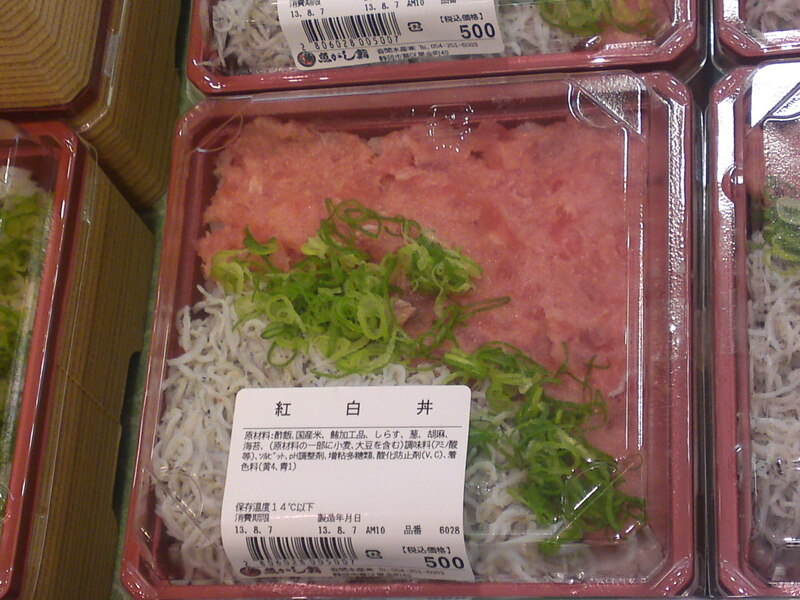 A Shizuoka specialty featuring grated yam and raw tuna atop sushi rice. 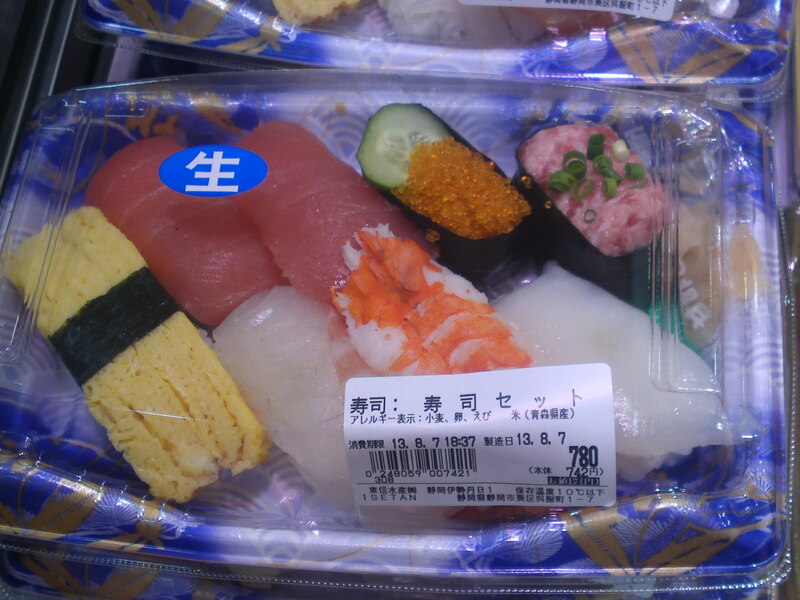 Another Shizuoka specialty featuring pieces of broiled eel and shredded omelet atop sushi rice! 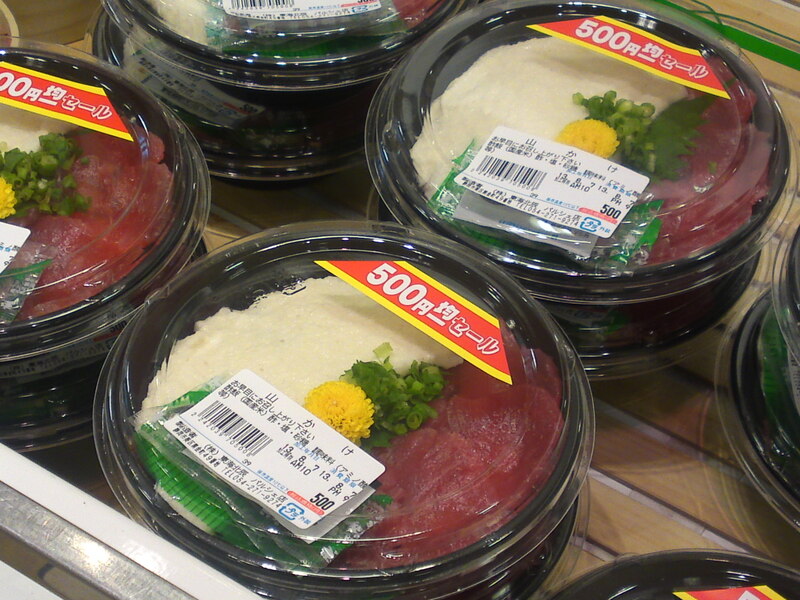 Plain tuna slices atop sushi rice! 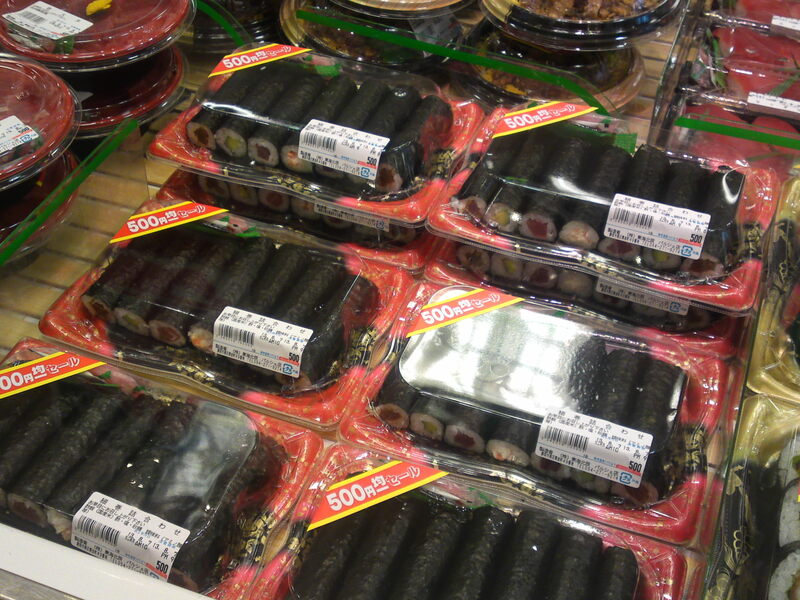 Set of 7 different thin sushi rolls! 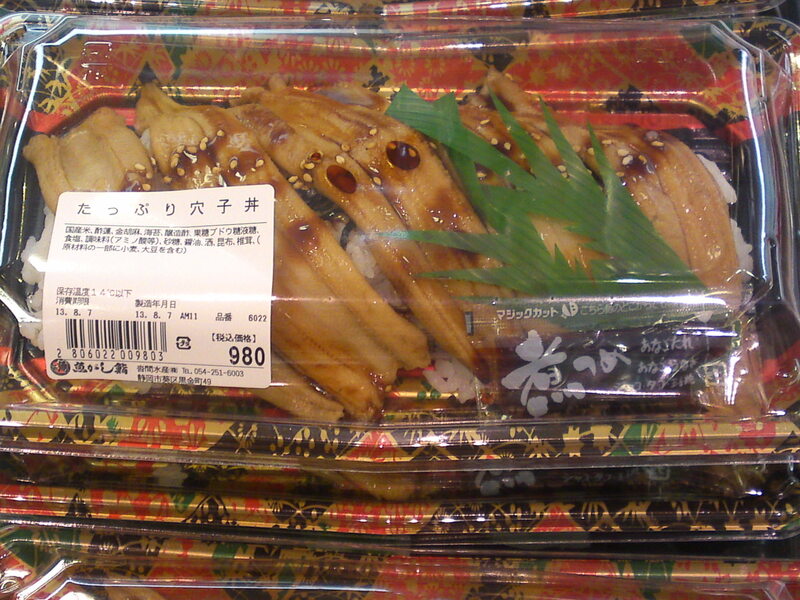 Sliced Deep-fried prawn sushi roll! 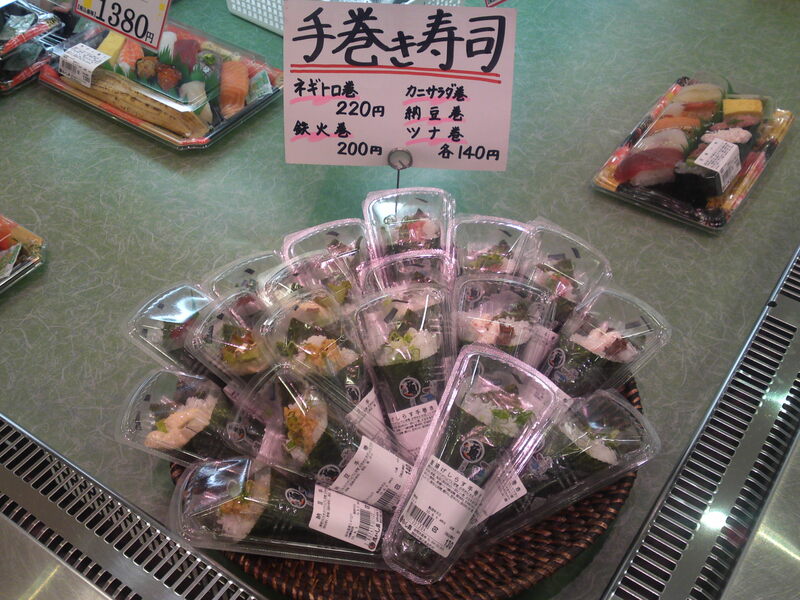 Another Shizuoka specialty: broiled conger eel atop sushi rice balls in nigiri style! 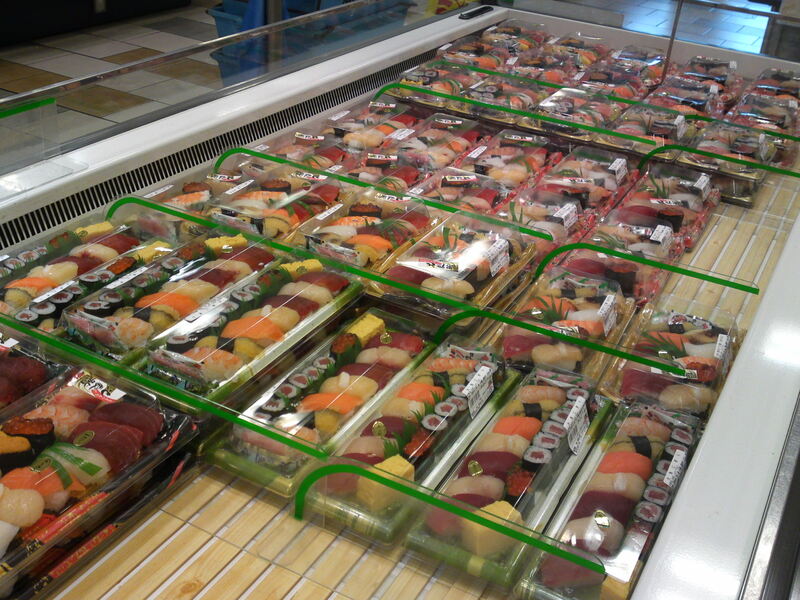 A general view of the sushi takeouts you can purchse till evening! 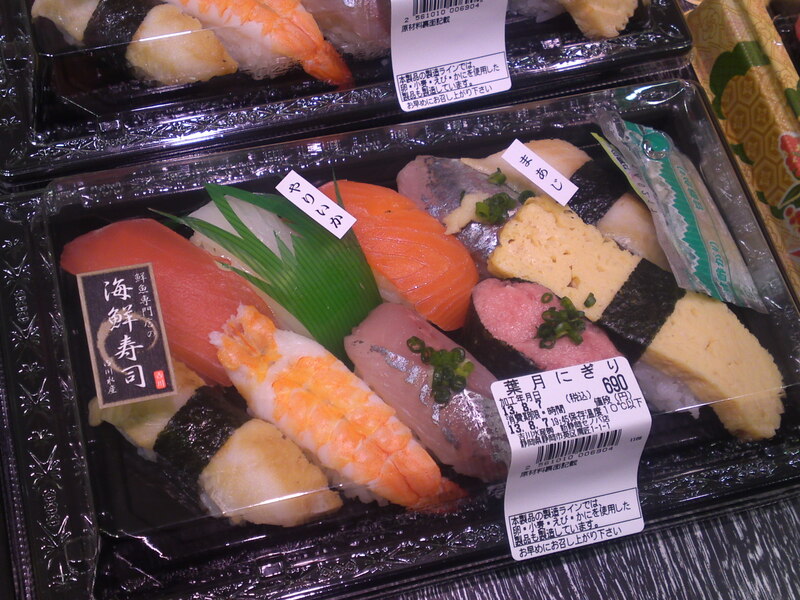 Next time I’ll take you to another part of Shizuoka JR Station Parche Department Store!